I’m sitting in the middle of the Costa Rican mountains, surrounded by coffee trees and coyote cries. And I’m here for a host of complicated reasons, but largely because of Jonathan Safran Foer’s Eating Animals. I’ve read many accounts of people claiming that a book has “changed my life,” but Eating Animals did in fact change my life, and it changed it in two ways. The first in that I became a vegetarian. The second has nothing to do with animals or meat. I’m no stranger to materials about the benefits of the all-veg life and the horrors of the meat industries, but they always seemed a bit like one-sided rabble. I never trusted them enough to let them affect my real life. But I trust Mr. Safran Foer. Before I picked up Eating Animals, he was already on my short list of favorite fiction writers because I trust his renditions of people and the worlds they experience. In the case of EA I further trusted his candid motivation for crabwaddling from fiction over to nonfiction; what more honest inquiry is there than that of a parent who wants to know what to do for his child? I also trusted the facts not just because of the motivations and methods with which they were acquired, but because they came paired with discussions of the real life questions that eclipse, in practicality, any fact sheet: questions that no one was asking. Because I trusted Eating Animals, I gave it the power to affect my real life. I challenged myself with Mr. Safran Foer’s main question, “can I be emotionally ok with the social consequences of not eating meat?” I grilled myself on the particulars; “when I go to order a sandwich at lunch, can I never again choose the chicken-and-swiss panini? Can I be ok with that? Can I tell my mom that I won’t eat the same meatloaf she’s been feeding me for over 20 years? I just ate turkey at Thanksgiving; do I have what it takes to walk into Christmas dinner and tell my grandma I won’t eat the same roast ham we’ve had every year that I can remember? Do I have the gall to turn down my boyfriend’s steak kebabs?” I decided to find out. I leapt off the meatless cliff and discovered that I did in fact have it in me to surmount the emotional hurdles of becoming a vegetarian. For me, the most compelling aspect of EA, what really convinced me to make a change, was the collection of letters from farmers. Reading the words of the people who know live animals and dead meat best cut through that rabble in a way that no other text or documentary had. I’ve always loved the way Mr. Safran Foer manipulates form to find ways of taking characters and readers to places no one else can seem to put their fingers on, and the ingenuity in form of EA- the treatment of social questions and particularly the inclusion of unadulterated first person accounts- was enough to jolt me out of my carnivorous stupor. And so EA changed my life in a little big way. Then it changed it in a big big way. It was the form that did it. Reading those letters from farmers clicked together several vagrant notions that had been clunking around my head for years. My first anchorless conviction was that I wanted to travel through Latin America. I’ve spoken fluent Spanish for years (how I learned is an entirely different story), and I’d long been itching to find out what lay south of the border. My second drifting desire was to find out where coffee comes from. I visited the Brooklyn Botanic Gardens on a field trip chaperoning a class of elementary school students in 2007, and in the tropical room the guide showed us a coffee plant. I stood there slackjawed and could not get over the fact that the coffee I drank daily out came from this unassuming plant. How did I not know that coffee came from a tree? More frustratingly, how had I never wondered where it did come from? The third half-formed curiosity began bumping up against the first two about two years ago, when I started writing for examiner.com as Manhattan Green Living Examiner. I was finding an increased tendency among New Yorkers to eschew certified organic products in favor of local ones. I started peeking into locavore movements and quickly realized that, while there was a considerable argument in favor of locavore practices from an environmental standpoint, it was a lifestyle I’d personally never be able to adopt. Coffee comes from the tropical room. There’s no way I can get it within any of the accepted locavore radii, and there’s certainly no way I’m giving it up. This then lead me to consider, if one of the biggest factors in a food’s “greenness” is the distance it treks to get to your plate (or cup), is there any such thing as sustainable coffee? I wondered what I’d have to do to find out. About a year ago, right between Thanksgiving and Christmas- those meatiest of holidays- I read Eating Animals. I initially picked it up because it seemed relevant to the writing I was doing about sustainable food; I’m also I’m addicted to Mr. Safran Foer’s fiction, so I figured his nonfiction would be just as juicy. In reading it I not only changed my diet, I figured out what to do with all those aimless ideas. I would in fact travel around Latin America; I would in fact see where coffee comes from; I would in fact find out if it could be “sustainable” in spite of being shipped around the world; and I would do it all by listening to coffee growers and compiling a book of first person accounts from the people who really know coffee: people who live it. As a 25 year old English Education NYU grad up to her armpits in debt, I in no way represent a coffee buying, shipping, roasting, or distributing entity or anything of “industry interest.” I have no hypothesis I’m being sent by some corporate logo to prove or disprove to hinder me with blinders. I am in fact as untethered to the product I’m exploring as Mr. Safran Foer was to meat. I am a broke New Yorker who drinks black deli coffee three times a day. And I want to know the stories behind the people who make it possible for my city to consume the coffee it does. I want to know what the coffee we drink means for people I never see, people who are responsible for its existence. Just like we’re eating animals, we’re drinking people. And as a drinking person I want to hear from the people whose livelihoods I consume every day of my life. A nasty breakup took care of any qualms I had about leaving New York (and took care once and for all of how to turn down those steak kebabs)! I finished out the school year in my NYC public school teaching position, sold my bike, donated my winter coats, and bought a one-way ticket to San Jose, with a vague plan to divide a year between Costa Rica, Panama and Colombia (countries chosen purely because I knew one person in each who’d give me a roof and a meal for at least a night or two). I had no idea what I was doing, but I decided to do it anyway. Before I left I read every book I could about coffee, but I arrived pretty much ignorant. From the second I hit Central American soil I’ve spent the past 3 months listening to anyone who will tell me anything about coffee. I’ve visited over 20 farms, toured milling and roasting plants, slept in remote fincas, forded rivers, learned to make tortillas, mounted horses, wandered through living agroforestry labs, scaled mountains, picked bushels of ripe coffee cherries, tasted local harvests, recorded more than 50 conversations, dined with corporate gurus, and attended two major industry conferences. In the vein of Mr. Safran Foer, I went looking for stories from farmers, but I quickly realized that coffee refuses to be contained at any level, even “at origin.” Thankful to be blinderless, I broadened my inquisition to include anyone who does anything to make coffee possible. I’ve recorded narratives from farmers, mill owners, exporters, engineers, scientists, agronomists, cooperative founders, business presidents, and people who hold coffee jobs I never could have imagined existed. 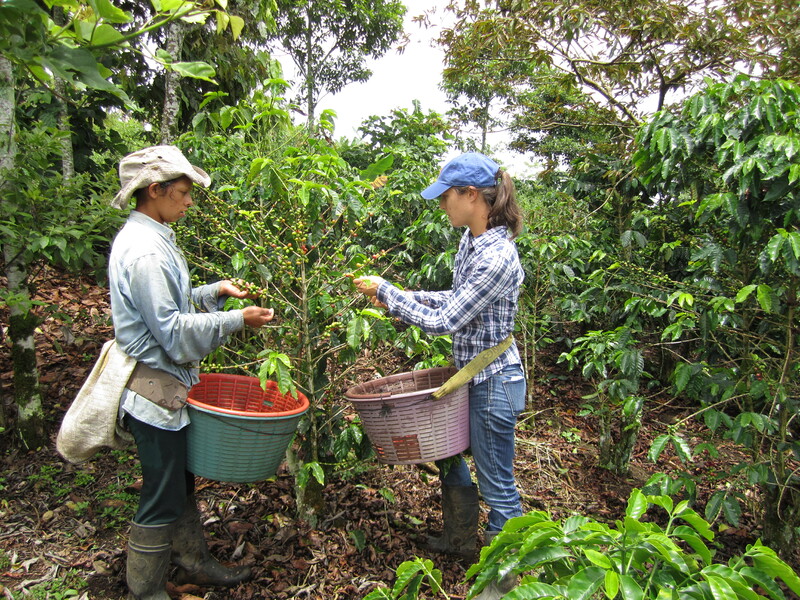 I’m still anchoring my work in farmers and their stories, but I decided to trace the coffee of the farmers I meet up the chain and see where it goes. The paths I’ve followed are by no means simple and rarely are they even logical and even less often do they pretend to be anything apart from pure self-interest, but they are always filled with incredible stories. Just like the infuriating scientific paradigm that the presence of the observer always alters the observation, my own story has become wrapped up in those that I hear and tell. At last! A book about coffee that doesn’t focus on the “half-caf mocha-joka” and goes to the heart of the matter, where that glorious liquid originates…the farmers! I am anxious to read Rachel’s book. She visited our farm in Costa Rica and was eager to get out in to the fields and stand shoulder to shoulder with the pickers, gathering their stories. Just wanted to share my hiliarious blog with a like minded fellow traveler. Hope you enjoy mine as much as I have enjoyed yours.